Come to sew, scrapbook, knit, read, retreat, have a girlfriend get-a-way, family reunion or vacation in the beautiful Black River Falls, Wisconsin area. Just an hour away from La Crosse or Eau Claire, WI; 2 hours from Minneapolis or Madison; 3 hours from Milwaukee, Green Bay, Dubuque or Duluth/Superior; 4 1/2 hours from Chicago, Black River Falls, WI is just off I-94. Welcome to Creative Cottage Quilting Retreat and Crafting Retreat, as a long time quilter and crafter, We have incorporated many extra's to help our guests enjoy a pleasant and productive retreat. When you stay at the cottage you are the only group here. Creative Cottage is a craftsman style home that sleeps up to 10 people, with Wi-Fi, central air conditioning, a comfortable den with cable TV, a large work room with 10 five foot work tables, gas fireplace and flat screen tv. Everyone comments on how much larger the house is once they step inside, there's plenty of room for everyone! 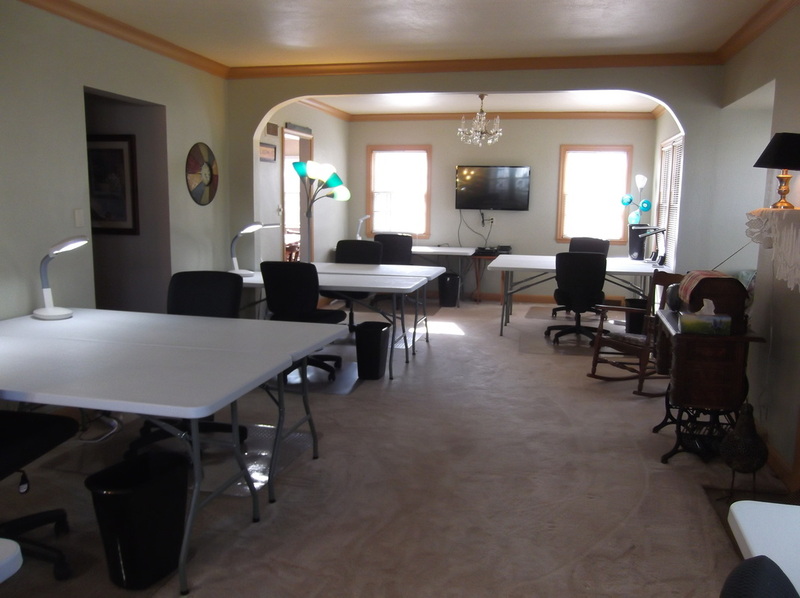 We have comfortable office chairs on wheels, work lights, a large cutting table where 3 people can be working at one time, 2 ironing boards and irons; and 2 large design walls. Keep cozy with the gas fireplace in the workroom where there is plenty of room to move about and lots of windows for natural light. The kitchen is completely stocked with an eat in table and includes a microwave and dishwasher. We have a spacious bedroom and full bath on the main level and 2 bedrooms and a full bath upstairs. Creative Cottage provides you will all the amenities and comforts of home, just bring your personal items and food for meals. Relax in the beautiful backyard garden and enjoy your meals on the patio complete with dining set. Consider us for families in town for funerals, weddings, girl-friend weekends, family reunions or sporting events. 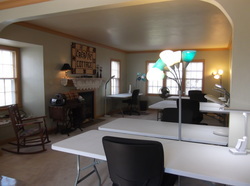 Creative Cottage is located minutes from Historic downtown Black River Falls. There is parking in the back parking lot for 3-5 vehicles as well as street parking. Within minutes of Creative Cottage you'll find the Foundation Trail, a 4 mile hiking trail that surrounds the city, Hoffman aquatic park, the Lunda center indoor pool, numerous restaurants, antique shops and Sand Creek Brewery. Within 30 minutes you'll find 3 wineries and quilt shops. Bring your bikes, canoes and kayaks and enjoy the beautiful countryside, we can even arrange for you to lock them up at night in our garage.